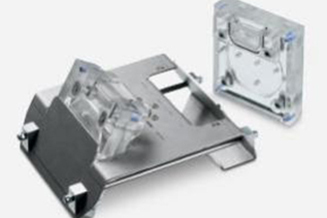 The ZentriForm is a system for the manufacturing of microstructured elements consisting of silicone. These elements are mostly used in the area of development of microfluidic or microoptical systems. 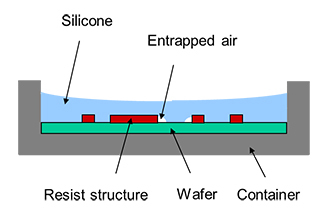 In the majority of cases, the elements are molded from structures on a silicon wafer. The ZentriForm system consists of a centrifuge, a rotor, 2 insets for the rotor and accessories. The figure on the left shows the conventional way of molding. The wafer sits in a form. The silicone mixture is degassed with vacuum and then poured into the form and being crosslinked. The drawbacks of this approach are: Air can be entrapped at the structure and the top surface of the silicone is not flat, which makes the part not usable as a stamp for hot embossing. The figure on the left shows the principle of operation with the ZentriForm-system. Only one of the two insets is shown as cross section. The inset rotates around the rotational axis of the centrifuge. 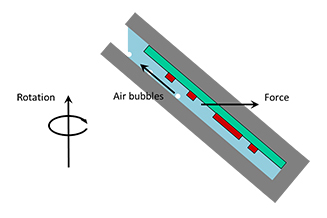 Air bubbles are transported out of the inset. At the same time, the mixture is pressed against the structures on the wafer, ensuring highest contour accuracy. 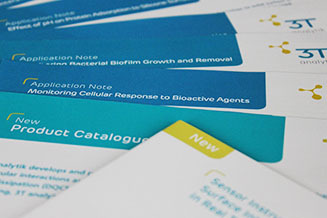 The finished part has the same thickness everywhere, which makes it suitable as stamp for hot embossing processes. The rotor can be used at speeds up to 2000 revolutions/min. Materials in contact with the silicone mixture are PC, PMMA and FPM (sealing) and the surface of the wafer including the structure on it. The materials have been chosen so that frequently used materials such as Sylgard 184 (DowCorning) or Elastosil 601 (Wacker) can be processed. The silicone pieces can be bonded onto glass or onto another piece of silicone after treatment with oxygen plasma. This step completes the fabrication of a microfluidic chip.